I pondered for a long while of making AMVs with some ATLA girls being the rock group. Toph plays the drums. Duh. This one is obvious. Mai plays the bass. She is just like that, seemingly in the background still setting and ruling the base of it all. Then we have Azula, Katara, Ty Lee and Suki. Yes, I am bad as that. Sorry Katara fans, maybe Zutara did that to me. Ty Lee fits best the dorky ever-smiling background singer and dancer. And who plays lead guitar? Weeeeell... who fits better playing the electric guitar better that Ms. Blue Lighning herself, our beloved Psycho Princess! Ty Lee *jumps up and down being all her happy-go-lucky self* Me is in. Yay! Azula: What did he say about "seemingly in the background still setting and ruling the base of it all." Katara: And that's the reason I am not a part of that band! Sokka: Hmmmmm this is HOT! ^ I think Katara shoud have the lead guitar, and Suki should be the "fan-girl" (doh ). But I disagree, Azula is the best for the electric guitar! 'Zula's still runnin' this, fools! I'll provide you the cash, chocolate bars, and coke (the fizzy drink) you need for the project. ...Fine, I'll get you some TyZula comics, too. Korra is Best Avatar! You gotta Deal With It! I hate that Fred came on after Korra. I actually saw a stupid second of it... A second! I will never get that second back! Azula should be the manager of the team. That would fit her personality perfectly! Doesn't the band need a singer? Katara could do double duty on the mic and the tambourine. I can't see Katara as a lead singer for some reason. Backup singer maybe, but I imagine the lead vocalist duties would go to Azula. It helps that her voice actress is a singer already. Well, if she's not singing, then give her the sax. After all, she's got the blues. ^Sometimes she has the blues but not all the time. Wait what does this have to do with shipping? Oh, I overanalize things to much. Nevermind. Methinks you missed the pun. Katara has the ]blues. Hi, I'm new, glad to meet you all. Well, hey there new kid! Welcome to the crazy and fun club house that is the world of ASN! My name's EndlessFame55, but you can call me Endly! I'm basically the local Irko (Father/Son Iroh and Zuko) fangirl around these parts. Also...I'm a bit of a Lex Luthor and Clark Kent nut, but I'll save that for later! Anyway! Come here and let me love on you, newbie!! Yes, I am primarily a Kataang shipper. ^^" Very sweet, emotional, deep couple there. Fun to watch. So glad they got married and had kids. Though book 3 zuko had much better hair. Everyone had better hair in Book 3. Especially Aang. Welcome PSU! Can we call you Psuduck? Oh, my friend! You're in the Avatar: The Last Airbender fandom, now. The word interesting totally doesn't even begin to define what goes on here in the Shipping thread. Honestly, you could probably sit there and name forty different out of this world and totally crazy relationships, romantic or no, and I assure you that somehow...someone on this website would be able to pull up fan art of it. Nothing and no one is safe in the Avatar fandom. At all. Every character that breathes in this show has been shipped with someone. Even the Korra characters has been shipped, and haven't even had lines let!! That's just how crazy we are here, I'm afraid. But don't worry, you'll get used to it in no time. I'm a Kataang shipper too! Although, other than Kataang, Ursroh (Ursa/Iroh) and some Toko on the side... (Toph and Zuko) I don't acutally ship anything. I'm more of a non-romantic family supporter. Love the relationship between Zuko and Iroh! Zuko's relationship with Zhao is only slightly more toxic than his relationship with his sister so who knows! @EndlessFlame -- As a Katara Fan, I have seen it all with Katara. From the popular (Kataang , Zutara [Blech]) to the somewhat hits (Jetara [Blechx10], Harutara ), to the total WTF ships (Kacest/Watercest, Azutara, Katoph, Katozai). So, at this point, nothing would surprise me lol. 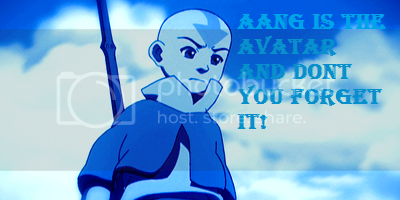 I like to friendship Katara very much, but romantically, only Aang. How many blech's does Zukaang get? I do not support any of those ships -- characters do not swing that way. I will say this though -- Zuko and Aang is a good friendship, gets brotherly towards the end. Oh my goodness. I think I might love you already. You think almost exactly as I do. Come here, once again, let momma hold you and love you, again~! I agree with all of the above! They had a very brotherly relationship towards the end of the series, and the hug in the finale? OMG. ALL THE FEELINGS. SO CUTE. SO CUTE. Big Brother!Zuko is so precious! Also, just to give it a shot, you wouldn't happen to watch Smallville or Supernatural, would you? 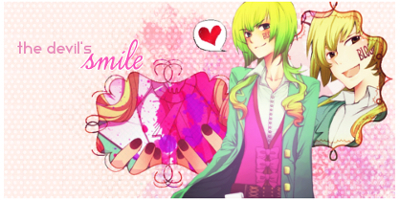 *smiles* Well, what can I say? I love that people don't always think of slash when it comes to two males interacting with one another. Take for example Lex Luthor and Clark Kent from Smallville (The two guys that are in my graphics), they have a very tight brotherly relationship in the series and would do anything for one another, and Lex even once told Clark that he loved him. But you know how fandom gets, they always think that they're--more than friends. It gets kind of silly to see it all the time, and with me...I don't like slash at all. I mean, I don't mind it, and I understand why people like it...but I've never liked it when it came to my favorite people--considering that I just don't consider the characters in that way... and I always just try to overlook it when I can. So anyone who doesn't think of the characters in that way when they get all close and brotherly is automatically awesome in my book! And aww, that's okay! I just taking a shot. It would have been cool if you did like them!